July was a busy month for me. The work piled up and all I did on weekends is rest and sleep. I don’t know why but I really felt exhausted. I had planned dishes to cook on weekends but it just did not materialized. Thank God our company decided to give an end to our Saturday work. Yes! I can truly enjoy my weekend. I have been planning on cooking Kinilaw na Tanigue (Filipino version of ceviche) for a couple of weeks now. Today, I got the energy I need to cook and blog again. 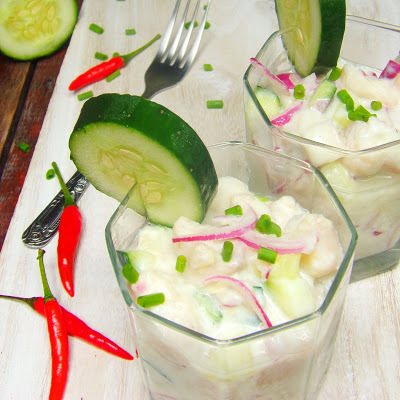 I first thought of cooking Sinuglaw (Sinugba + Kinilaw), a combination of grilled pork and kinilaw na tanigue but I remembered imagining kinilaw na tanigue swimming in yogurt sauce with diced cucumber that would freshen up the dish. The thought of yogurt and cucumber is refreshing enough, right? Kinilaw is the Filipino version of ceviche. The fresh fish, my favorite are tanigue and anchovy, is cooked in an acidic juice, usually vinegar, calamansi or lime and other spices like onion, chili, cilantro and ginger are added to flavor it up. My tatay usually cooked the diced fish in vinegar and never leave it out of the vinegar sauce but I have seen chefs simply marinating the fish for several minutes and draining and squeezing it to remove the excess liquid. The process is to simply remove the fishy odor from the fish. Then the spices are added and tossed. While watching those chefs preparing kinilaw, an idea hit me. Why not add yogurt and cucumber to the dish? The onion, ginger and chili adds spice to the dish. Then, the refreshing cucumber and yogurt would balance the heat from the spices. The yogurt also adds a nice texture to this dish. Some tips, buy the fish early in the morning to ensure freshness of the fish. You can use the white vinegar from the grocery but I prefer the native vinegar because of its sour and hint of sweetness. Remember to chill the dish and served cold. This savory dish is at its glory when served cold. Wash the tanigue and drain, then pat dry with clean kitchen towel. In a bowl, pour in the vinegar and calamansi juice. Marinate the fish for 20 minutes. Drain and squeeze out excess liquid. Place in a clean bowl. Tossed in onions, ginger, diced cucumber, and chili. You can opt to chopped the chili for extreme spiciness. I just divide it into three parts since my parent don’t like chili food. Set aside. Puree yogurt and cucumber in a blender. Season with salt and dash of pepper. Pour into the tanigue mixture and tossed. Season with salt to taste. Topped with chopped onion spring. Chopped parsley is highly recommended for this one. Chill and served cold as an appetizer.